Nobutsugu Sugiyama has been a Tokyo-based professional freelance photographer ever since he was in the Nihon University College of Art. He was based in Sydney Australia from 1986-1991. He currently specializes in Commercial & Advertising photography, primarily portraits and fashion. His works have appeared on advertisements/magazines/photo books/publications/exhibitions/etc. of well-known companies all over Japan. Having done numerous workshops and lectures, he has also appeared in magazines and on television as a commentator. He released his e-photo books and apps which made him a pioneer in the photography industry, leading him to be internationally recognized. He now holds exhibitions worldwide. 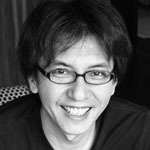 Nobutsugu Sugiyama gives overall strategic advice for planning and production of art related productions. Having a career as a Commercial & Advertising photographer, he is versed in the areas of applications, e-photo books and website programming. He will support you through his various marketing experiences and knowledge that he has gained throughout the years. Recently, he has been called an “expert” of e-photo books, and acts as a consultant for “Promotion” and “Branding” using e-books, blogs and SNS.